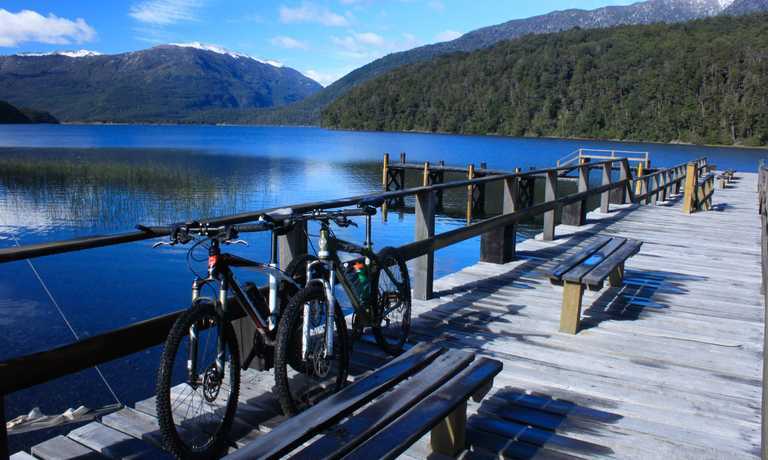 On this 8-day bike tour of the lakes and volcanoes of Northern Patagonia you will cycle through several national parks and come across exceptional views. You need only look forward to and enjoy your tour - all lodging is arranged for you and your transfer will meet you at the airport. Upon your arrival, our friendly staff will be waiting for you at Temuco's Airport, followed by a 2 1/2 -hour drive to the quaint little mountain village of Malalcahuello. Here we check and assemble the mountain bikes (MB) and commence our first day of an epic MB tour. Today we'll ride only 30 kms / 19 miles to warm up for the days to come; passing through pristine forests of araucaria trees (monkey puzzle tree) at Nalcas-Malalcahuello National Reserve until coming up on the Navidad Crater of Lonquimay Volcano, (last eruption - Christmas of 1988). At dusk we'll visit the Malalcahuello Thermal Spa, the most modern of the region, to relax and enjoy the soothing baths. The resort has a fully equipped large indoor thermal pool, and two small pools at different temperatures (one very cold and one very hot). The Spa offers massages and beauty therapy services for an additional cost. For those more interested in revelry and merry making, there is a restaurant and bar. This morning, following breakfast, we head off in our private minibus to until we get to the gateway of the National Park Conguill?o, 61 kms / 38 miles southwest. The highlights of this wild protected area are the impressive araucaria tree forests, which are considered a living fossil (Araucaria araucana), and the most active volcano in Chile, the Llaima Volcano (3125 mts / 10.253 feet). Here we begin pedaling along a slightly steep path up to the park's main entrance situated by the beautiful Captr?n Lagoon, overlooking a striking view of the Llaima Volcano. Then the road ascends through vast forests of Nothofagus and araucarias, reaching an altitude of 1.650 meters above sea level (5.413 feet). This is followed by an exciting descend towards the spectacular lake Conguill?o, where we visit the Park's Information Center. The landscape of the Park is characterized by the Sierra Nevada Range, the Conguill?o, Arcoiris and Verde lakes, and the active volcano Llaima, with its extensive lava flows that formed a huge moon-like valley. We'll ride across the whole park from north to south, arriving to the accommodation of your choice, which can be cabins at the edge of the park or lodging at the town of Melipeuco. Both places offer basic comfort standards. Today we travel in the minibus 24 kms / 15 miles from Melipeuco to the hamlet of Caren Alto. 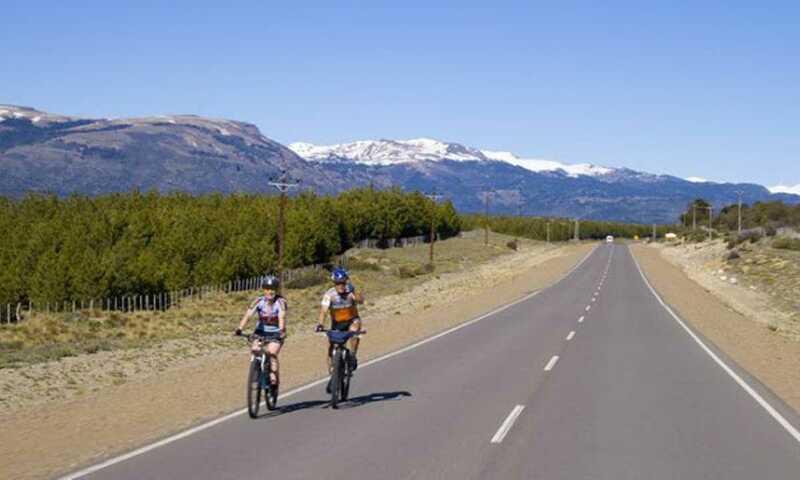 We unload the bikes here and set off for the Sendero de Chile (Trail of Chile) and ascend the mountain Nevados de Sollipulli along its eastern slope, which borders Argentina. We will appreciate the beautiful native forest and the wonderful views of the Nevados while the trail challenges our skills and resistance. Bordering the Reigolil River we return to the rock-strewn road towards Curarrehue and continue biking through a narrow valley until reaching the minibuses near Curarrehue. Traveling by minibus, we head to Puc?n (50km), the main adventure tourism destination in the Lakes & Volcanoes District. Lodging at the hotel in Pucon and dinner in a restaurant in town. We'll take the day off, which means that we won't ride our bikes. However, in Pucon we can continue being active by exploring the wide array of activities to choose from; here are some suggestions to do during the day: Rafting in Trancura River Class 3 / 4; Ascend the active volcano Villarrica (2.847 meters / 9.340 feet); and Hiking in Huerquehue National Park (all these activities have an additional cost). Then in the evening, we'll go to Huife Hot Springs, a thermal center located by the Liucura River and surrounded by evergreen native forests. We'll have a buffet dinner at Huife's restaurant and then head back to Pucon. Lodging at the hotel in Pucon. Departing from Pucon, we drive 8 kms / 5 miles by minibus to Palgu?n Bajo, where we start biking (option to travel 10 kms / 6 miles more). The road leads us by the Palguin valley through the National Park Villarrica, with views of scenic waterfalls formed by basaltic rock, as we will pass several majestic snow-capped volcanoes such as Quetrupillan and Rucapillan. The vegetation changes from raul? (Nothofagus alpina) and hualle (Nothofagus oblicua) forests to araucarias as we ascend to Chinay, the higher point of the day at 1.250 meters / 4.101 feet above sea level. From Chinay we'll experience an exciting descend through the forest; jumping and dodging natural obstacles like roots and mud puddles. If this incites too much exertion, there is an option to visit the Geometricas Hot Springs on the way down. While riding downhill we have a wonderful view of Calafquen Lake, which is situated on the eastern border of Conaripe, a town that was totally destroyed by the 1964 eruption of the Villarrica volcano (Rucapillan). 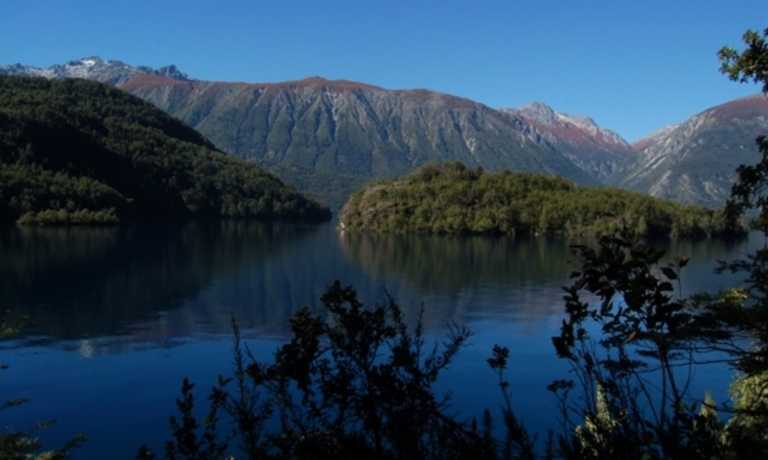 The minibus will be waiting for us in Conaripe to take us alongside the lakes Calafquen and Panguipulli to finally get to the National Reserve Mocho-Choshuenco (94 kms / 58 miles drive). We'll stay at Huilo Huilo, a private ecological initiative located next to the reserve. A long day awaits us! Early morning we'll begin to cross the Park Huilo Huilo from north to south. We follow an old road used in the past to transport timber for exportation, biking through the foothills of Mocho Volcano to Pilmaiquen, where we turn to the valley of the Pillanleufu River. Strong rains undermine the way sometimes transforming the path into a true adventure, crossing streams on foot or rappel. The route continues to descend until we arrive at the Maihue Lake. In Maihue Port we can rest in the minibuses, enjoying the landscape of Futrono and Puyehue lakes, arriving at Puyehue Thermal Spa Center (165 kms / 102 miles drive). Lodging at Hotel in Puyehue. 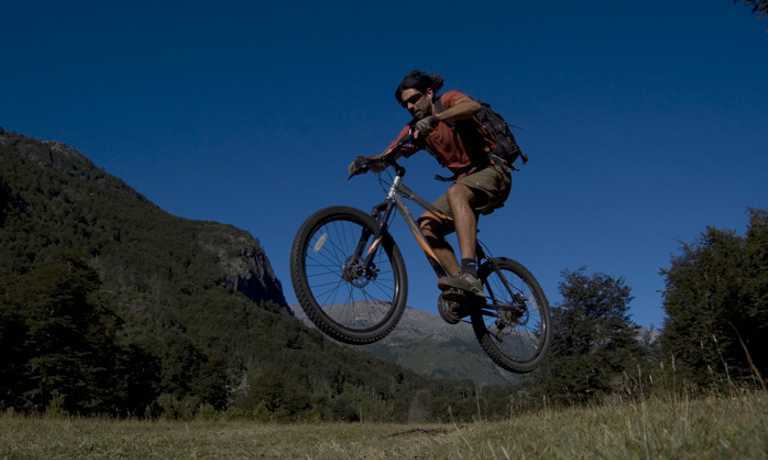 On our last day of mountain biking, we leave Termas de Puyehue and set off the road ascending through the path Aguas Calientes and enter Puyehue National Park. During the ascent we're going to have fantastic views to the Encantado and Toro lakes, and later of the Antillanca Volcano. We'll pass through the Ski Center and keep ascending until we reach the Raihuen Crater, at approximately 500 meters /1.640 feet diameter. Arriving at the Mirador Hill we'll take in a spectacular view of diverse mountains such as Tronador, Puntiagudo and the Osorno Volcano. From the look-out point we'll begin to descend along the Casablanca and Gaviotas streams until arriving at the Rupanco Lake. In Port Poncho the minibus will be waiting for us and en route it is possible to see the Calzoncillo Falls (280 meters / 918 feet high) at the other shore of Rupanco lake. After traveling 80 kms / 50 miles we'll enter the village of Ensenada, located at the eastern shore of Llanquihue Lake at the foothill of Osorno Volcano. Lodging at the hotel in Ensenada, accompanied with a farewell dinner. Transfer to Puerto Montt Airport to catch the flight to Santiago.